Have you been going through the websites of the different turf suppliers Ringwood can offer in an attempt to find a reliable local company with a proven record of excellence? If that accurately describes your current situation, then you have struck gold by arriving at Abbey Turf. Call our friendly team of professionals any time on 02380 812 302 to find out more about our prices and delivery services. Abbey Turf possesses nearly three decades of experience in producing high quality turf, so you know ours is a name you can trust. Our wealth of industry knowledge is truly second to none. Our turf suppliers Ringwood will be happy to walk you through our range of different products in order to determine which one will be the most suitable option for you. At Abbey Turf, we only use the finest sandy soils and highest quality grass seeds to grow a turf that is completely weed free. To ensure that our high standards are always maintained, our Ringwood turf suppliers inspect our product daily. You will find no netting in our turf. We are one of the very few turf suppliers Ringwood has available who always aims to deliver all turf within 24 hours of it being harvested. We offer very flexible delivery times to match your exact schedule and needs. Please take some time to browse through our virtual gallery for a selection of high resolution images of our team hard at work doing what they do best. You can also see our prepared deliveries, so you know what to expect when choosing us as your Ringwood turf suppliers. Why Choose Abbey Turf Suppliers In Ringwood? 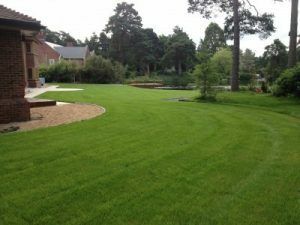 With more than 25 years of experience in the business, we are ideally placed to be your regular turf suppliers in Ringwood. Our independent company started with 10 acres of turf that has now expanded to a 180 acre site. Despite our great success over the years, we are still looking for ways to grow even further. If you are not completely sure which type of turf is the right choice for your garden, then reach out to our expert turf suppliers Ringwood can always rely upon. We would be happy to listen to your requirements intently and walk you through all of your available options to find that ideal solution. As a company who prides itself on customer service excellence, it makes us extremely proud to say that a significant number of new requests are from referrals and recommendations. This means that our clients have benefited from our turf suppliers Ringwood service to such an extent that they regularly point their acquaintances our way. As you’ll now be able to tell, other turf suppliers Ringwood has available will simply not be able to adequately compete with everything that Abbey Turf brings to the table. Should you still have any questions about any of our products or services, please do not hesitate to get in touch via one of the below contact methods. Are you now convinced beyond a shadow of a doubt that the Abbey Turf team is the group to call over any other turf suppliers Ringwood offers? If so, then there are several quick ways to get in contact with our team. Please feel free to either call us on 02380 812 302, e-mail your requirements right on over to info@abbeyturf.co.uk or fill out our online form. We are always here to help and look forward to hearing from you very soon. Whichever way you reach out, we will not leave you waiting and will respond very shortly!